Welcome to Parenting for Liberation, a virtual community to connect, inspire, and uplift Black folks as they navigate and negotiate raising Black children within the social and political context of the US. Parenting for Liberation believes in the power of parents to conceive, birth, and nurture liberation for the future. Beginning with a virtual platform featuring blogs and podcasts to connect, inspire, and uplift Black folks as they navigate/negotiate raising Black children within the social and political context of the US., Parenting for Liberation is rooted in an Afro-futuristic vision of a world where black parents are in community with each other to raise black children without fear and instead parent for liberation. 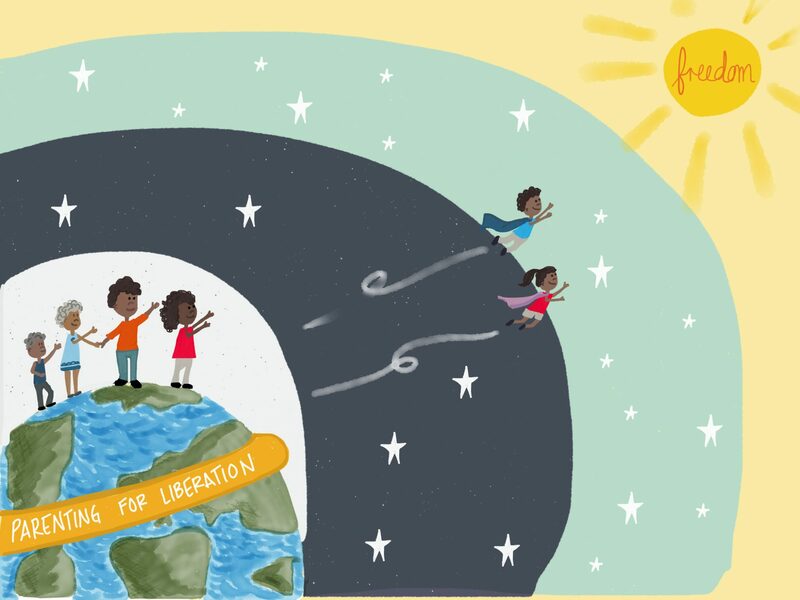 To date, Parenting for Liberation has produced over twenty of audio podcasts with 8,550 downloads via SoundCloud and iTunes, self-published a StoryBook Workbook distributing nearly 100 copies, and curated hundreds of blog posts. Extending beyond virtual connections, Parenting for Liberation has convened groups of Black parents in Los Angeles, San Diego, Detroit, Chicago, and Idaho, holding space for Black parents who are freedom fighting for our collective liberation, to engage with one another, and share how they operationalize liberation in their homes. Being a Black feminist who has worked in the mainstream violence against women’s movement, there is a lot of talk about how violence starts in the home; however as a Black woman raised by a strong Black woman, I also know that liberation starts in the home. This space is for the incredibly passionate warriors who are fighting for liberation and freedom on multiple fronts–on the front lines of the movement and on our very own front porch/door. As activists we know that the arc of justice is long and winding, but we have very pressing needs that are right in front of us—our children. This podcast is for those who seek to envision and create Black liberation, and until the world is rid of anti-Blackness, consistently strive to create Black liberation within our homes and in our communities for our children. This virtual community will be reminiscent of kitchen-table, living room couch, style conversations with activist parents, parent activists throughout various movements. In their work they are fighting injustices in the world from mass incarceration, school-to-prison pipeline, police brutality, policy and systems change, gender-based violence, forced marriages, detentions and deportations, educational inequity, community safety, to declaring that Black Lives Matter. **Parent is defined broadly: from activist parents, stay-at-home parents, working parents, single-parents, co-parenting parents, young parents, grandparents, step parents, second-parents, like-a-parent, kinfolk-parents, spiritual parents, everyday parents who all have something to share about parenting for liberation.